As a man who has never had a dog before, I suppose I was most taken aback by how relatable My Dog Tulip turned out to be. 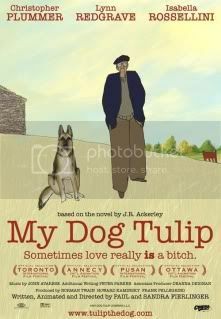 Based on J.R. Ackerley’s memoir, My Dog Tulip follows Ackerley as he relishes in the bonds of friendship. This friendship, this love, is with his dog Tulip. In a world where Ackerley had not been able to make a human connection, he found refuge in his companion. There’s a solemn simplicity to the way Paul and Sandra Fierlinger broach this notion of canine companionship. It’s largely due to the rather crude animation style that Sandra Fierlinger employs – characters, settings, etc. are not the most elegant, but it serves to match the material well in that it is rough around the edges. So much of what My Dog Tulip dwells upon is a sense of quiet sorrow and amusing observations, all which are highlighted by this particular animated style. Ackerely’s words provide the whole film with a true sense of grace; the verbal dexterity of his words is the film’s most compelling element and serves to punctuate the emotionally one-sided aspect of the relationship. Ackerley opens himself up through his words, to the point that one can easily relate to his sense of loneliness, along with his sense of glee when interacting and pleasing his best friend, Tulip. 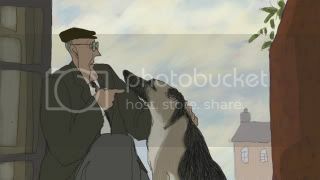 The film could have just as easily been called My Best Friend, Tulip, with the film never losing sight of its purpose. My Dog Tulip can at times become difficult to watch. Ackerley’s honesty portrays him as somewhat egotistical. The film’s ending, in which he notes that Tulip was indeed his best friend because of her undying devotion to him, leaves little room for judgment. Tulip may or may not have judged Ackerley – it is what he perceives as her actions to him that makes that assumption. Can a pet pass judgment? If not, is that truly their most valuable quality in the end? Perhaps that’s the point of having a pet? Regardless, it all rings as rather selfish to me. In that, I suppose there’s a barrier to what a pet owner perceives as self-centered. There’s a sense of companionship to be had with any pet, but the philosophy in which Ackerley subscribed to makes the whole relationship one of demand on one end, without much thought as to what the other wants. It’s rather unfulfilling if you ask me. And with that, even with the film’s visually eccentric style and impressive writing, I too was left a little unfulfilled too. There’s a vacant emotional component to the film that can’t be felt – it’s all in Tulip.